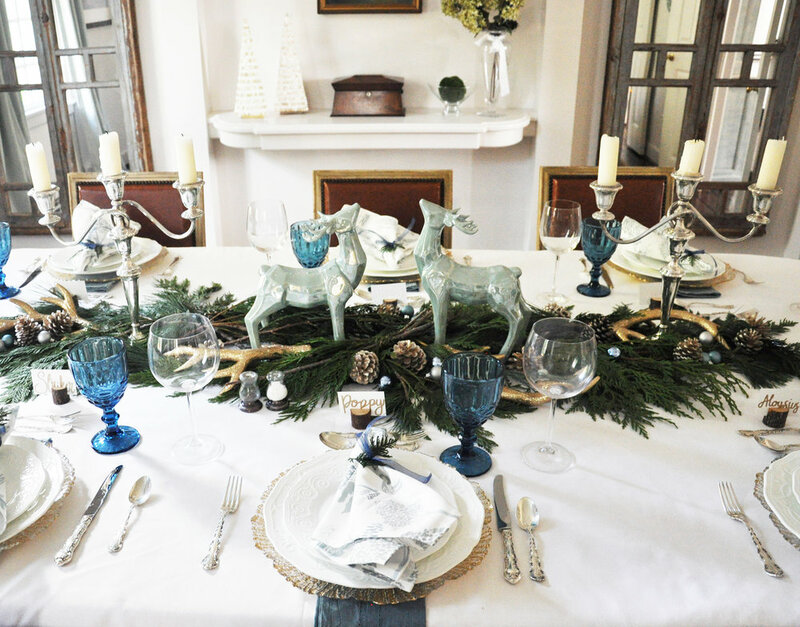 This Holiday Season we put a Sara Hillery Interior Design spin on the traditional Christmas table with a charming blue and white color scheme with hints of gold and glass that feel fresh, like newly fallen snow. Bringing nature inside is always a priority for us, and this table-scape offers an organic way to emphasize the outdoors even while family and friends savor the most sophisticated of holiday meals. The napkins are made from our Sara Hillery Home fabric collection in the Virginia Mammals pattern, and served as the overarching inspiration for the holiday décor theme. The toile-with-a-twist design features an assortment of native Virginia animals and trees that brings a flash of delight and whimsy for diners of every age. A crisp and clean white table cloth contrasts with and highlights the verdant pine and spruce garland that serves as part of the table’s centerpiece. Mini ornaments in varying shades of blue give the arrangement an inviting, festive feel. Gold dipped antlers and darling glazed porcelain deer figurines add glitz while reflecting the light of the antique candelabra, adorned with gold and white ornaments. We incorporated white everyday Wedgwood Traditions china into the place setting- this blank canvas lets the food take a starring role. Clear, gold-flecked chargers that peek out from underneath the plates offer a glimpse of glamour and cheer. As always, little details are what set holiday decorations and dressings apart and make guests feel special and welcome. SHID marked each place setting with small pieces of wooden logs that held each guest’s name as a playful, yet helpful way to guide friends and family to their respective seats. A sprig of spruce sweetly tied with a ribbon complements the muted, blue-gray shades in the napkin’s design with a boost of greenery. Even the elegant blue water goblets send a signal that this time of year is cause for celebration. However you decorate your holiday table, however you choose to welcome loved ones to your holiday table, we wish you a very happy holiday season!